Seojack WiFi Adapter promise you Unprecedented online experience! We will provide you with perfect, good service throughout. If you have any questions or problem when using, please feel free to contact us before leave the product review. We will try to resolve any issue for you within 24 hours. Sincerely At Your Service. Advanced Technology for wider coverage and greater speed. Seojack wifi adapter complies with the new Wi-Fi performance standard known as Wi-Fi AC. It works with the advanced technology MU-MIMO(Multi-User Multiple-Input Multiple-Output), which nearly eliminates dead spots by reusing and intelligently rerouting radio signals that confused older products. With Seojack adapter, anywhere within a typical house is likely to be adequately covered. Being able to operate in two different frequency ranges, 2.4GHz and 5GHz. The total bandwidth of Seojack adapter can sum up to 600Mbps. This gives it a notable advantage of being better able to carry network traffic that requires extensive bandwidth. Examples of such traffic include HD video streaming, voice applications like VoIP telephony and graphics-intensive games. 1. Please must install the driver first, then insert the usb wifi adapter. 2. Please keep your hands off while detecting heating. 3. Please pull it out after using and pack it for the usage next time in case of overheating. POWERFUL CHIPSET & ANTENNA -- The lastest RTL8812BU chipset and the flexible antenna provide better performance for signal connection when signals are weak. Along with beamforming technology, Seojack wifi adapter helps boost speed, range and reliability. 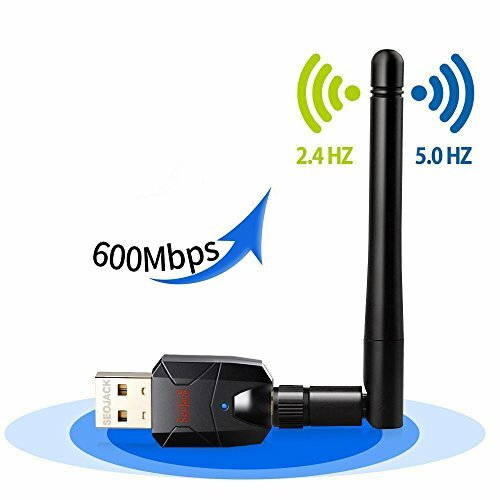 HIGH SPPED -Dual Band (5GHz 433Mbps or 2.4GHz 150Mbps) connections for lag-free HD video streaming and gaming. Ultra-fast AC600 wireless speed. CREATE WIFI HOT SPOT FOR YOUR PHONE: Featured with Soft AP function, it allows you to create a hot spot when your PC/laptop is under wired Internet connection. Boost Wi-Fi to your mobile devices is easy now! If you have any questions about this product by Seojack, contact us by completing and submitting the form below. If you are looking for a specif part number, please include it with your message.